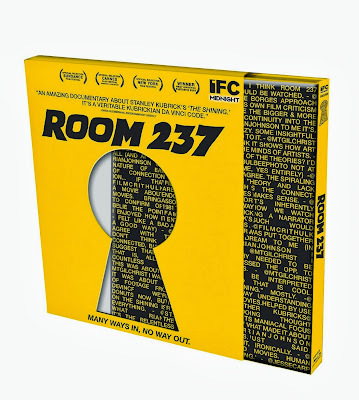 Room 237 reminded me of being a graduate student in a film studies program, surrounded by theories and ideas that are occasionally profound. This is not a typical film, or even documentary, but more of a visual essay on the possible meanings behind Stanley Kubrick’s The Shining. Some of the theories given throughout the film are a bit of a stretch, and there are times that the details being pointed out by the theorist aren’t even entirely accurate. Part of what makes this film interesting is the variety of possibilities, all so very different. The unique thing about this film is the fact that there is absolutely no new footage. It is all either footage taken directly from The Shining, or additional film footage from random movies which help to coincide with whatever the various theorists are discussing. There are a variety of main ideas found within The Shining, and each is argued by a veritable authority. The main theories within Room 237 about The Shining’s deeper meaning include discussion of the Holocaust, Native American Indians, the Apollo 11 moon landing, and even the past as a whole. Having the footage from the film play as the experts discuss the film is helpful when there seems to be truth behind their ideas, but it is a double-edged sword for those who are over-thinking and under-watching. There is one section of the film where one of the supporting characters in the film is discussed and one theorist mentions a point where he sighs when asked to do something, but when the footage is shown, there is no sigh. There are also many issues of continuity discusses within the film, one involving the same actor’s clothing in one of the scenes. Some sequences have glaring continuity issues, such as a chair disappearing from one shot to the next, or a sticker disappearing from a bedroom door. If nearly any other director had done this, it would have quickly been dismissed as an error, but Kubrick’s celebrity has made it so that nothing he did was a mistake or unintentional. Instead there are plenty of people willing to come up with a variety of excuses for his intentional errors in continuity. The only problem with this is the errors in some of the theorists. There is a scene where the actor’s pants supposedly change from shot to shot, and according to the theorist who points it out, this is intentional and significant for some reason. The only problem with this theory is the fact that the pants never change. He claims that the pants are striped in the close-up and then solid in the master shot, but the stripes simply look solid from further away. It is clear in the high definition presentation of Room 237 that the pants are actually the same, proving some of these theories may be the result of a stretched imagination and poor eyesight. Even disagree with some points, and unconvinced that Kubrick was the god-like filmmaker everyone makes him out to be, Room 237 was exactly my type of film. Regardless of my belief, I enjoy the thought process behind these theories. This is the way I think about movies, and sometimes my theories are a stretch as well. One thing is certain; it is far more interesting than simply reading The Shining as a ghost story. The Blu-ray release includes a commentary track with more theories from internet theorist Kevin McLeod, known to many online as mstrmnd. The special features also include a panel discussion with some of the experts and the filmmaker at the Stanley Film Festival, which is nearly an hour long. There are also 11 deleted sequences, a making-of featurette for the music, and a discussion of the Mondo poster design.